For 2015, the LS series is available in three models. New for 2015, the advanced technology systems in the Lexus LS 460 AWD and long-wheelbase Lexus LS 460 L AWD are enhanced with the Blind Spot Monitor and Rear Cross Traffic Alert systems as standard. These systems – already standard on the long-wheelbase Lexus LS 600h L hybrid model – provide additional safety when changing lanes or backing out of parking spaces. All convey a powerful presence through bold styling. From the signature Spindle Grille to the elegant body lines, the LS projects its self-assured power and the promise of driving pleasure. Inside, drivers and guests are welcomed into a realm of exquisite craftsmanship and unmatched refinement. Premium materials, impeccable finishes, advanced features and meticulous attention to detail combine to create an unrivaled in-cabin experience. The interior is complemented by the LED-based Advanced Illumination System and signature details such as the analogue clock with LED illumination. Commanding performance is assured. The LS 460 AWD and LS 460 L AWD are crafted around a 360 horsepower, 32-valve 4.6 litre V8 and an eight-speed automatic transmission. This combination delivers invigorating acceleration, seamless shifting and impressive efficiency. Meanwhile, the LS 600h L features the advanced Lexus Hybrid Drive – a system combining a potent 5.0 liter V8, a dual-mode electronically controlled continuously variable transmission, two high-torque electric motors and a powerful hybrid battery to deliver 438 net system horsepower and surprising efficiency. All models in the LS series feature the added all-weather confidence of an advanced all-wheel-drive system. The LS features an Enhanced Drive Mode Select system: a simple turn of the dial delivers a distinct combinations of performance, efficiency, handling and ride comfort, allowing drivers to tailor their experience to their mood or driving conditions – from emotionally engaging, to maximum efficiency, to smooth and easy. The LS hybrid may even operate in full electric vehicle mode for short distances. The LS takes advantage of advanced laser-welding, acoustic materials, aerodynamic body panels and other components to confer incredible quietness and ride comfort plus extraordinary high-speed stability. A rigid body structure and enhanced aerodynamics make for impressive driving dynamics and a road-hugging ride, while electric power steering and advanced suspension systems offer a more engaging road feel and agile steering response. The LS series features a state of the art Vehicle Dynamics Integrated Management (VDIM) system – offering heightened control for more confident handling. This system integrates all elements of vehicle movement, anticipating any potential instability – such as a skid, slide, or over- or under-steer – then automatically makes subtle corrective action through a combination of steering, braking and throttle adjustments. Safety is essential on every Lexus, so all LS series flagship sedans feature an impressive complement of safety technologies – from 10 airbags to active systems including Vehicle Stability Control; Traction Control; Automatic Braking System with Brake Assist and Electronic Brakeforce Distribution systems; and Lexus Smart Stop technology. Other safety features include: the Blind Spot Monitor with Rear Cross Traffic Alert System; the automatic headlamp system; fast-acting high visibility and reliable LED rear tail lamps, daytime running lights, fog lamps and high-mount brake light; clearance and backup sensors; rain-sensing wipers; and a direct tire pressure monitoring system. There’s even an onboard first-aid kit. All models in the LS series are impressively equipped with comfort, convenience and luxury features, including: A 19-speaker 450-watt Mark Levinson Reference Surround Sound Audio System with integrated XM Satellite Radio and steering wheel-mounted controls; Bluetooth connectivity for hands-free use of mobile devices; premium leather seat surfaces; climate controlled, heated and air conditioned front seats; 16-way power adjustable driver and 12-way power adjustable front passenger seats; a three-setting driver’s seat memory system; voice-activated hard disc-based navigation system with a 12.3-inch liquid crystal display and integrated back-up camera; electronic analogue gauges; the Lexus Remote Touch interface; power windows with auto up/down and variable speed control on all windows; water-repellant front door glass; wood-grain interior trim; heated steering wheel on a power tilting/telescoping column linked to the driver’s seat memory system; LED map lights; cruise control; the Lexus Smart Key System with Push Button Start; power assist doors and an easy close trunk; the intuitive parking assist system; power heated mirrors linked to the driver’s seat memory system; a power moon roof; front windshield deicer; and more. The Technology Package adds: electric power steering enhanced with variable gear ratio steering; front and rear air suspensions enhanced with the adaptive variable suspension system; four-zone independent climate control; the Lexus pre-collision system; rear seat side air bags; power adjustable heated and air conditioned rear seats with butterfly headrests and vibration massage feature; automatic high beam system; milli-wave radar cruise control; rear cool box and rear door sunshade. The F SPORT Package has been enhanced for 2015, with the addition of the automatic high beam system and milli-wave radar cruise control. Performance upgrades in this package include electric power steering enhanced with variable gear ratio steering, and sport-tuned front and rear air suspensions, enhanced with the adaptive variable suspension system. Safety systems are enhanced with the Lexus pre-collision system, while F SPORT-exclusive styling enhancements include: 19” forged aluminum 10-spoke wheels; unique shift knob and leather-wrapped steering wheel; a full skirt package; F SPORT front grille; aluminum dash accents; and aluminum scuff plates. This model features a longer wheelbase to provide additional rear seat leg room. Other standard features on this model include: 19” noise reduction aluminum alloy wheels; electric power steering enhanced with variable gear ratio steering; front and rear air suspensions; four-zone independent climate control with the added climate concierge; the Lexus pre-collision system; power adjustable heated and air conditioned rear seats with butterfly headrests and vibration massage feature; rear seat climate controls; front and rear side acoustic glass; automatic high beam system; dynamic radar cruise control; rear cool box and rear door sunshade. This model may be enhanced with the available Executive Package, which adds: infrared body temperature sensors; rear seat audio controls; rear seat Blu-Ray entertainment system; the Nightview, Advanced Pre Collision System with full auto brake, Lane Keeping Assist, Lane Departure Alert, Obstacle Detection and Driver Monitoring systems; right rear seat retractable ottoman with integrated cushion airbag; right rear seat shiatsu massage system; premium leather seat surfaces; walnut wood trim; leather covered instrument panel; LED headlamps; and more. This long-wheelbase, hybrid-powered model offers the pinnacle of flagship luxury and advanced technology. In addition to previously listed features, this model includes: four-zone independent climate control with soft-touch heater controls; infrared body temperature sensors and the Climate Concierge system; premium leather seat surfaces; ECO indicator; Escaine roof head lining; heated wood and leather-wrapped steering wheel; wood and leather-wrapped shift knob; leather covered instrument panel and door armrest; premium illuminated entry system; automatic powered opening/closing trunk; milli-wave radar cruise control; LED rear seat reading lamps; Lane Keeping Assist, Obstacle Detection, and Pre Collision systems; LED headlamps with the Adaptive Front Lighting and automatic high beam systems; and more. This model may be fitted with the available Premium Executive Package, which adds: the Advanced Pre Collision System with full auto brake; the Lexus Nightview system; and more. 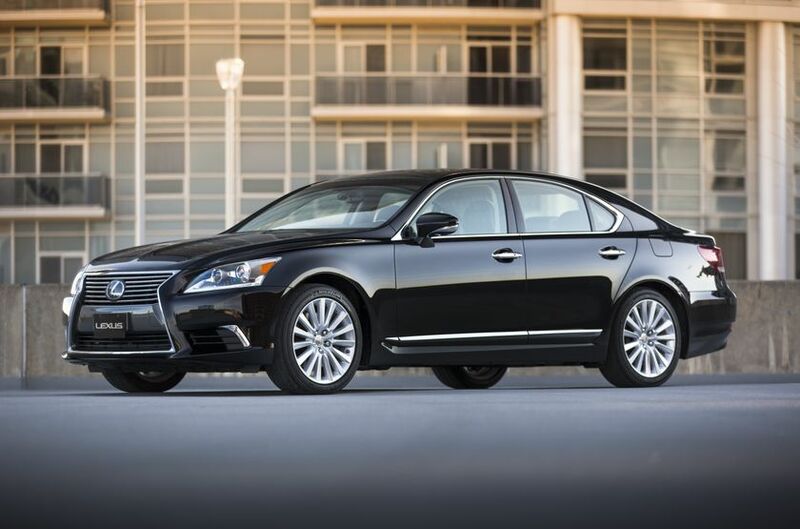 The 2015 Lexus LS series is now on sale at Lexus Dealers across Canada. For more information on features and specifications, visit www.lexus.ca/ls. Lexus in Canada is the exclusive Canadian distributor of Lexus luxury cars and sport utility vehicles through a sales and service network of 36 dealers across Canada. With 13 Lexus models on the road today, five of them being hybrids, Lexus has the largest luxury hybrid lineup; allowing guests a choice in a large range of luxury vehicle segments. In the 2011 J.D. Power and Associates Initial Quality Study (IQS), Lexus won the most segment awards, four in total, of any nameplate. For more information about Lexus products, and Lexus’ pursuit of perfection, visit: www.lexus.ca.